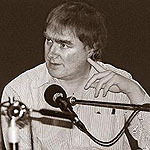 Jim Naughton came to Oxford from the University of Lancaster in 1982, initially as the University Lecturer in Central European Studies, and then from 1988 as the University Lecturer in Czech and Slovak. He was solely responsible for the creation and development of Czech and Slovak studies at Oxford in their present form, and was also known internationally as a scholar and translator. However, he will, perhaps, be best remembered as a teacher and for his encyclopaedic knowledge of the Czech and Slovak languages and literatures, not to mention his formidable skills in Scottish Gaelic, Mandarin Chinese, piano playing, and the years of expertise gathered in the pubs of Oxford. He inspired fierce loyalty in all his students, and formed lifelong friendships with many of us. Jim suffered a stroke in October 2013, and died on February 9, 2014. He is greatly missed by all of us who knew and worked with him.